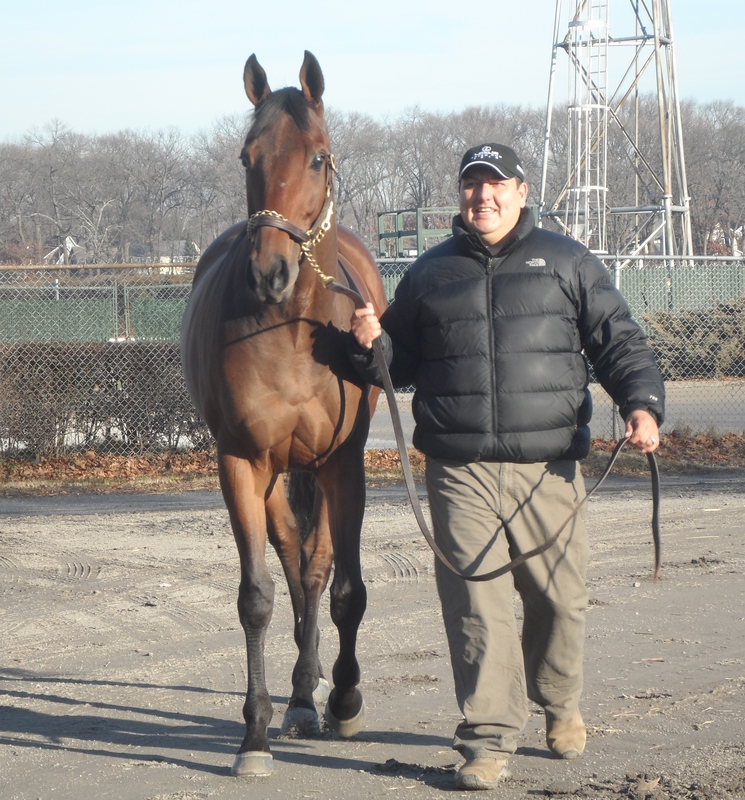 Followers of trainer Mark Hennig’s Twitter timeline were the first to hear the news last Friday, when Hennig posted a somewhat cryptic message after the fourth race at Aqueduct. Great, get some rest big boy! The “big boy” was Socialsaul, the horse that Hennig had purchased for owner Mike Samotowka in 2010, and the horse that Hennig had claimed back for Samotowka the day after Christmas. In May of 2013, the first time that Socialsaul raced for a tag, he was claimed, the only horse taken from the five-horse race in which he’d finished second. He was coming off a string of losses, and Samotowka expected that the horse would be claimed and shortly retired. Over the last 19 months, the bay gelding was claimed nine times. And last Friday, Samotowka made sure that the ninth time would be the last. “I had told Mark to follow the horse for me, so that when he got to a point that I could retire him, I’d claim him back,” Samotowka explained. Socialsaul had been on quite a tear recently, winning five of six races between October 19 and December 7, finishing second in another, with about a week and a half between races. The frequency of the starts caught Samotowka off-guard, and he missed an earlier opportunity to claim him back, because he didn’t expect the horse to be entered again so quickly. “This time, Mark called me to tell me he was entered last Friday, so I had to wire money to Aqueduct [for the claim], and we got it in just under the wire,” Samotowka said. 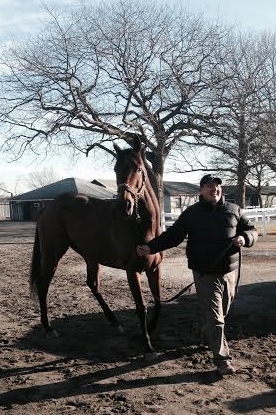 Then, it was out of his hands…and so, almost, was Socialsaul, as two other trainers also put in a claim for him. But Samotowka and Hennig won the shake, and for the first time in four years, Socialsaul was back with the man for whom he’d been named, Hennig’s assistant Saul (pronounced Sah-OOL) Castellanos. On Sunday morning, both Sauls were living up to their names at Hennig’s Belmont barn. In a stall at the end of the shedrow, Socialsaul pricked his ears at every new voice, at every visitor. Alert to the sound of a rustling peppermint wrapper, he nudged insistently for treats, and, standing outside of the barn, he kept looking towards the track, as if wondering when it would be his turn. Energetic, a little peremptory, and not even a little deferential, Socialsaul danced around outside the barn, reluctantly pausing for photos and for inspection. If he were happy to be reunited with Castellanos, he was showing it by making the assistant trainer work for it. Purchased for $35,000 as a two-year-old at the Fasig-Tipton sale in Maryland in May 2010, Socialsaul started his racing career in Hennig’s barn, though an early health issue resulted in his being transferred to another trainer. Breaking his maiden in his second start, the son of Readthefootnotes out of the Proud Truth mare So Social quickly made his way into the New York-bred stakes ranks, winning the New York Derby in 2011 and finishing second in the Grade III Discovery later that year. In 40 starts, he compiled a record of 11-8-3 with earnings of $514,375, more than half of that for Samotowka. Now a trauma surgeon at the Cleveland Clinic in Cleveland, Ohio, Samotowka is originally from Buffalo, and a big crowd turned out for Socialsaul’s New York Derby at Finger Lakes. Initial reports indicate that Socialsaul is sound, and in fact could have continued racing, but the thought of losing him to a claim made the decision to retire him an easy one. For now, Socialsaul will hang out on a farm, as Samotowka decides whether the horse will enter a retirement/retraining program or be given to a family friend as a riding horse. ← With Malibu Win, Is Shared Belief Back in the Conversation For an Eclipse Award? What a Happy ending for horse that tried every time and that someone loved him enough to buy him back a retire him!! So Great! God Bless..
Love to see these happy endings stories! I am so happy to hear of Socialsaul’s retirement. He was racing so frequently that, at his age, I was concerned about his safety. Bravo to his owner – he did right by the horse.